Goodwood - New Honda Civic Type R? It will be all white on the night! After months of uncertainty, today’s the day the big question over Honda’s all-new street fighter, the 2015 Type R, is answered. It will be launched in… white! Colour has always been integral to this most iconic of hot hatches. In its heyday of the early years of the 21st century a Type R in red was de rigueur. And the new model was previewed by a red concept at the Geneva show last year. And then by a blue one at the Paris salon last autumn. And now, on the eve of the 2015 Geneva show – where, it is alleged, the final production version will finally be shown, finally – Honda is teasing us with glimpses of a white one. Red, white and blue… geddit? 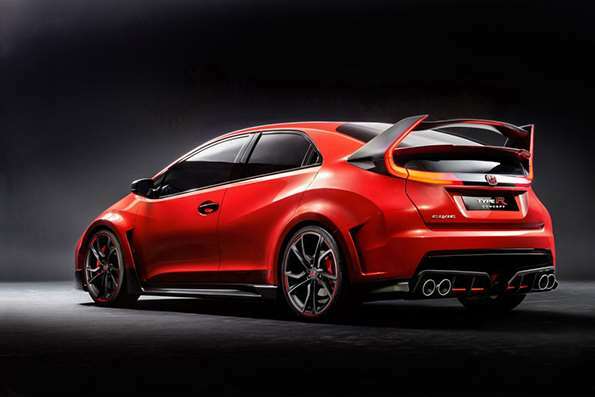 The new Type R has been developed in Britain and will be made at Honda’s plant in Swindon. The UK will also be one of its biggest markets. We assume so anyway. We can’t know for sure because we still don’t know all the facts about the car that we will be able to buy from the summer (and which 100 people in the UK have already put deposits down on). We do know it’s the first turbocharged Type R, has a six-speed manual ‘box and is five doors only – Honda has admitted that much. And from today our known knowns have swelled to include a top speed of 167mph, 19-inch wheels, four-piston front calipers and 350mm Brembo drilled discs. Oh and the white launch colour. But there are still lots of unknowns. Not just known unknowns – exactly how much power and weight? – but also unknown unknowns. Oh dear and now we are in Donald Rumsfeld territory. Just how clever, for example, is its mechanical innovation? It will be clever for sure; this is, after all, a Honda. 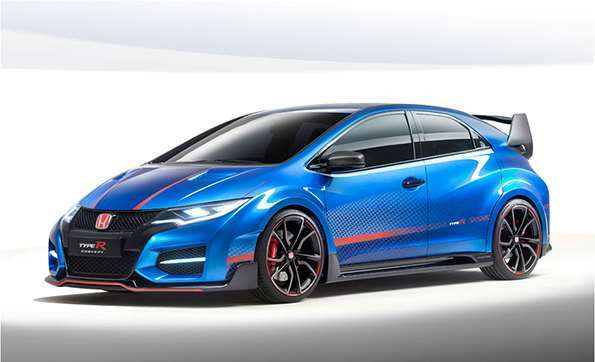 We know it’s front-wheel drive because Honda has said it will be the fastest front-driver around the Nürburgring Nordschleife, at under 8mins. Seat and Renault may have something to say about that, while another question is how it manage in in a world increasingly full of fast four-wheel drivers? VW’s Golf R and Ford’s reborn Focus RS will be deadly rivals. Rear-wheel steering? Adjustable dampers? Different driving modes? Clever electronic diff? Wait and see, says Honda. Certainly the aero does appear to be advanced, and Honda boasts of ‘exceptional high-speed stability and high levels of downforce’. It is a very large rear wing. Top speed is certainly impressive, at 167mph. Honda says is ‘unrivalled amongst front-wheel drive competitors’. Perhaps, but others remember are restricted to 155mph. The rest? Still speculation. But we can’t imagine £30k, 290bhp and 0-62mph in under 6secs to be that wide of the mark. Nor can we imagine the dramatic look has changed much over the Geneva and Paris show cars of 2014 (they are respectively the red and blue cars shown). We have been without a Type R since 2010 and, like big brother NSX, the replacement has had a painfully s-l-o-w birth. We will know all when GRR reports from the press day of the Geneva Motor Show on Tuesday 3 March. Well, all apart from perhaps the most important thing – what is it like to drive? We reckon that with a turbo bottom end and a VTEC top end it’s going to be a real flyer. The Baillon Collection – auction of the century?